Get Fit Kaua‘i and the County of Kaua‘i partnered together to lead an 11-week Youth Education & Advocacy for Health (YEAH) program developed by the Georgia Institute of Technology (Georgia Tech). 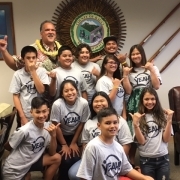 The YEAH program engaged 10 middle-school-aged youth from the Lihue Boys and Girls Club to conduct a neighborhood assessment, selected a meaningful project focused on increasing physical activity, and advocate for change with local policy and decision makers. The group met with Mayor Bernard Carvalho and gave a presentation to the Kaua‘i County Council. Their recommendation was to focus interest on park renovation using strategies such as movies in the park. As a result of students’ recommendations, the Kaua‘i County Council approved $80,000 to develop detailed architectural design plans that address the needs of the Boys and Girls Club assessment and the community at large. The students’ involvement in all aspects of the project helped create a stronger network of citizens empowered to work for changes that support a healthier lifestyle. Their participation will help build a foundation for life-long community activism. When community residents are engaged, elected officials take notice, which greatly improves the likelihood of achieving policy change and neighborhood improvements. We are proud of the youth that participated in the program and look forward to similar partnerships in the future.